The words tumbled from her mouth at a mile a minute. That’s just how Natalie is. She’s rarely quiet. It’s a wonder she stays silent at school but apparently she does, because she always has green smiley faces in her agenda and her teacher has called her sweet. “You got student of the month? That’s great!” I replied. “I get to go on STAGE!” Natalie repeated. When we got home she showed me this large paper that we had to fill out. It had spaces where we had to write what her favorite things were, she had to draw her family…just basically explaining who she was. Then I saw another piece of paper that said that the parent had to decorate the bulletin board for the student of the month. A lot of mothers love to decorate. A lot of mothers are talented. They can take a simple t-shirt and sequin it in under an hour. Me? I don’t like to decorate. My eyes glaze over when women start talking about décor and the like. Who cares? When people ask what my style is, I’m like, “Uh?” I have no style. I generally go for what’s on sale. I helped Natalie fill out her paper and she colored it. 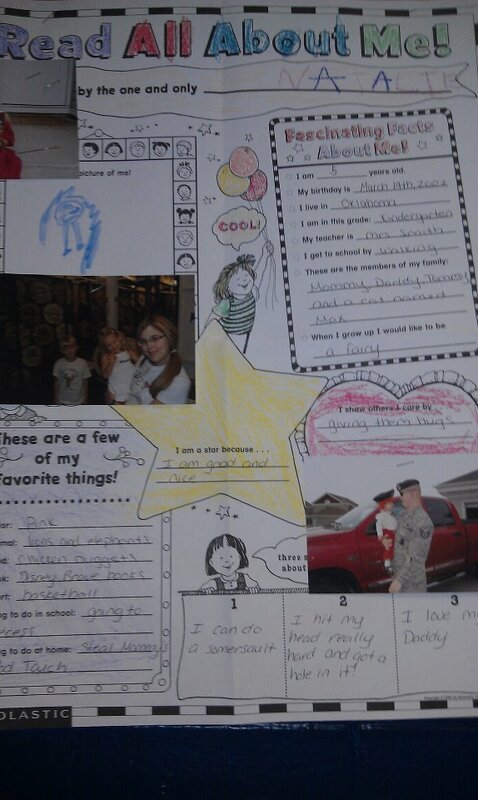 I added pictures for her to put on her bulletin board. I’m sure some mothers would buy border for the bulletin board to make it pretty. They’d cut out pretty designs and the like, maybe toss some glitter on there for a sparkly effect. Well, I figured the paper and pictures were enough. The next day I told her teacher that I was ready to do the bulletin board. She handed me a stapler and off I went. Do you see Natalie’s paper? Um, well guess what? A woman walked in and prepared to set up HER kid’s bulletin board. She had taken all the information from that paper and placed it all on a shiny pink background. Complete with a border. And I swear I saw glitter. I wanted to take a picture but there was a teacher watching me from the hall. She was either A) impressed with my daughter’s work or B) was snickering at my lack of decorating skills. Or C) my fly might have been down. It was first thing in the morning. I’m not totally with it then. Oh well. I know I’ll never be able to make a doll from sticks or a gourmet meal. I can't take a milk carton and create a fancy vase. I’ll stare at things on Pinterest and think, “That’s nice,” but know I’d never have the patience to actually DO it. But that’s okay. Natalie says I make the best jelly sandwiches (only jelly—she doesn’t like peanut butter. It feels “weird” in her teeth) and that has to account for something, right? As long as she thinks you are the best, that is all that counts! I'm also not a "crafty" mom- and either our school doesn't have special bulletin boards for the Student of the Month or my kids have never earned that particular prize. Possibly both. Yes, it counts for everything. Good work on the kids. Wonderful news about Natalie! And as long as she thinks you're the best, nothing else matters. I'm not a crafty Mom either. In fact, I probably would have done the same as you! Heck, I didn't even take the cookies in for Bree's class to celebrate her birthday with. I just sent them in with Bree. It's just not me...and I don't think Bree minds. Only your kids opinion matters and you are a great mom even without glitter! Heh, I'm not crafty either. I understand! Great job, Natalie!!! That's a very big deal!! Her board looked fine - you were stressin' over nothing!!! I wouldn't be doing any more than you either. And not just because I am uncrafty - but because I am also cheap. The important things: (1) Natalie got chosen Student of the Month, (2) you and she worked together on the display, and (3) she's happy. Unimportant things: (1) glitter, (2) competition with other moms. And above all: You have a great relationship with your kids. That is funny. Reading this post makes me feel all warm and fuzzy NOT to have kids in school. I would have done the same thing! I think the board looks just fine. Oh I would definitely be in the same boat as you! Don't feel bad. Congrats for your daughter though! This is why I don't need kids! I would prob ask her to do the board how she would want it, you know becuase she is the student of the month and all. Hooray for Natalie! I hated doing bulletin boards and I went to school for Early Childhood Education! So I feel your pain! Mine were always TERRIBLE! I love little-kid quotes. Modesty is for tall people.